Since 1980, Mark Rubel has made about a thousand recordings at his Pogo Studio in downtown Champaign IL for many wonderful artists including Hum, Alison Krauss, Rascal Flatts, Fallout Boy, Adrian Belew, Luther Allison, Ian Hobson and Henry Butler, for such clients as RCA, Capitol, Warner, Jive/Zomba, Volition Games, Electronic Arts, The BBC, Smithsonian, and many more. Mr. Rubel is on the national board of SPARS (the Society of Professional Recording Services) and belongs to the AES, NARAS, ASCAP, MEIEA, EARS, and numerous other acronyms. 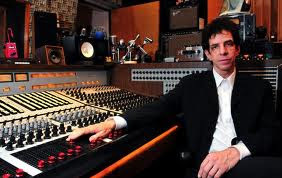 Having taught audio to thousands of students since 1985, Prof. Rubel teaches recording, music business, music technology and the history of rock, and is the Audio Director at Eastern Illinois University’s $65 million Doudna Arts Center. Mark writes for recording magazines, especially Tape Op Magazine for whom he interviewed Les Paul, Terry Manning and others. He works as a panelist, consultant, beta tester and legal expert witness. Mark has been in the thrash oldies rock band Captain Rat and the Blind Rivets for over thirty years. He plays many instruments badly and sings worse, and is ridiculously happy cultivating songs, students and cats along with his saintly wife, Nancy.